Oklahoma Sound Power Plus sound system lectern features four built-in speakers with gold-colored trimming for enhanced public speaking. 30-watt amp suits a small conference room style audience. Includes input jacks for additional multimedia options. High pressure laminate surface is stain and scratch resistant. Built in shelf provide additional storage. Ships ready to assemble. 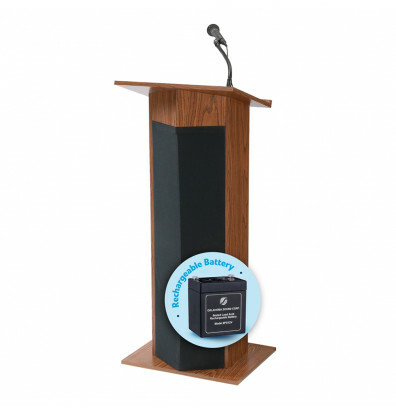 The sound system lectern is available in a mahogany or medium oak finish. Includes a wired handheld mic with a 9' cable, a lapel mic with a 10' cable, and a gooseneck mic holder. Includes a 12-volt rechargeable battery, which can power the lectern for up to 4 hours while speaking.